GALLIPOLIS, Ohio — A tale of two halves. 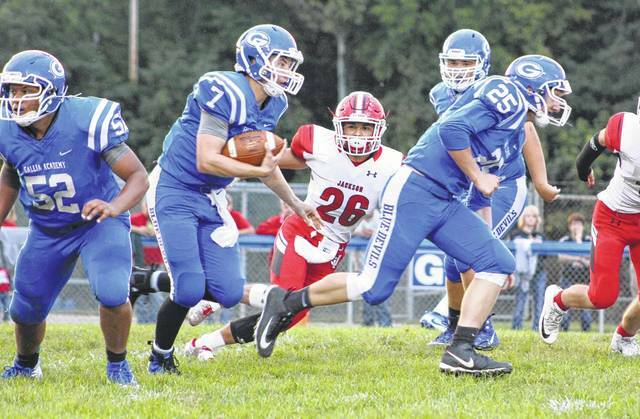 The Gallia Academy football team put together a spirited performance before halftime, but visiting Jackson simply had too much firepower down the stretch Friday night as the Ironmen rolled to a 34-0 victory during a Week 3 non-conference matchup at Memorial Field in the Old French City. 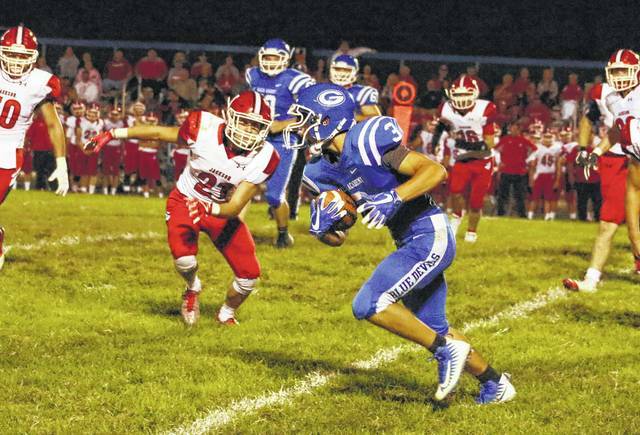 The Blue Devils (1-2) came ready for a fight against their former Southeastern Ohio Athletic League arch-rivals … and for 24 minutes, the hosts managed to keep things more than respectable against the highly-favored Ironmen (3-0). However, after coming out of the locker room at halftime, the game took a quick turn for the worst. Leading only 13-0 at the break, JHS put together a pair of crippling offensive drives that resulted in two Blake McCoy touchdown runs. The first covered 12 yards and made it a 20-0 contest just four minutes into the third quarter, then a 17-yard scamper just before the end of the period gave the Red and White a commanding 27-point advantage with 43.5 seconds left. Jackson tacked on its final score of the night — a 10-yard pass from Jared Icenhower to Reid Evans — with 8:51 remaining, making it a 34-0 contest. That score also resulted in a continuous clock the rest of the way, per the Ohio rule about 30-point leads in the second half. The Ironmen finished the night with a sizable 398-126 advantage in total yards, with 309 of those coming on the ground. The Blue and White, conversely, finished the night with more rushing attempts (32) than rushing yards (31). Jackson — which had twice as many first downs (20-10) by night’s end — also outgained the hosts by a 153-49 edge after halftime. Following the home-opening setback, GAHS coach Alex Penrod acknowledged that the Ironmen simply had too many pieces working against his troops. But, as the first-year mentor noted, he saw real signs of growth from his program — despite the final outcome. Though the Blue Devils didn’t score, it was encouraging to see how the hosts answered the opening bell. After Gallia Academy had the opening drive of the game stall out, Jackson took over possession at its own 23-yard line. The guests marched their way down to the 26 and had Michael Benson try a 43-yard field goal, but the kick sailed wide left — giving the hosts the ball back at their own 20 with under six minutes left in the first quarter. The Ironmen defense forced a quick three-and-out to get the ball back at their own 45, then the guests strung together a seven-play, 55-yard drive that resulted in a 7-0 lead following a McCoy 5-yard run. Benson tacked on the extra-point, giving JHS a 7-0 cushion at the 1:34 mark of the first. Gallia Academy put together a 10-play drive on its ensuing possession, but the drive stalled at the hosts 46 — which resulted in a punt. Jackson needed only three plays and 1:14 of clock to cover 67 yards, with Reid Evans capping things off with a 38-yard TD run. Gallia Academy, however, blocked the extra-point kick, making it a 13-0 contest with 6:47 left in the half. The Blue Devils put together their best drive of the first half with their next possession after using seven plays to get down to the JHS 16. The hosts, however, gained no yardage on their next three plays and ultimately turned the ball over on downs. Zach Workman picked off an Icenhower pass on the ensuing drive, but Gallia Academy turned the ball right back over on the next play as Payton Speakman picked off a halfback pass — giving Jackson possession at its own 21 with just over a minute left until halftime. Despite being outgained 245-77 in total yards during the first half, the Blue Devils were very much in the game entering the break. With the victory, Jackson has now won four straight over the Blue and White — but GAHS still holds the all-time advantage in the series at 42-41-5. Both teams committed one turnover apiece in the contest. The hosts were flagged five times for 30 yards, while the Red and White were penalized seven times for 50 yards. Justin McClelland and Jacob Campbell led the Blue Devils with 12 rushing yards apiece, with McClelland also completing 14-of-21 passes for 95 yards. Eight different Gallia Academy players caught at least one pass in the setback, with Campbell leading the way with three grabs for 22 yards. Cory Call also had two catches for 27 yards, while John Stout added two receptions for 14 yards. McCoy paced the Jackson ground attack with 163 yards and three scores on 21 carries, followed by Evans with 68 yards on four totes. Icenhower finished the night 5-of-8 passing for 89 yards, throwing one pick and one touchdown. Speakman led the JHS wideouts with two catches for 24 yards. 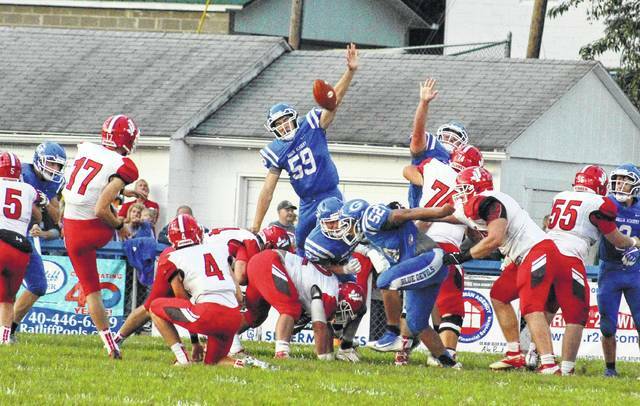 Gallia Academy also had five of the six punts in the contest. The Blue Devils will open Ohio Valley Conference play next Friday when Chesapeake comes to town for a 7 p.m. contest. Coach Penrod also believes that the last three weeks have prepared his kids for the start of conference play. “I am very proud of how our guys prepared all week long. From Week 1 until now, we’ve made the adjustments we’ve needed to make to be successful,” Penrod said. “Now, as we start getting ready for OVC play, we’re extremely excited with where we are at — but it does come down to finishing. I am encouraged, however, by how far we’ve come through three weeks. 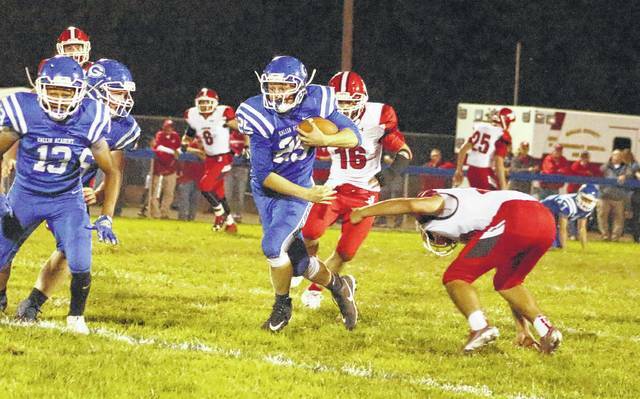 Gallia Academy junior quarterback Justin McClelland (7) follows a block by teammate Caleb Henry during a first quarter run against Jackson on Friday night at Memorial Field in Gallipolis, Ohio.